Which is the most popular Fiji island out of 332 scattered across the republic? Discover them here! The islands on the list, for the most part, are small secluded paradises! That's why we come. These islands are the most popular searched for Fiji on the internet. The information is good as of June 1st, 2013. Enjoy! The most searched island in Fiji is Turtle Island. A truly spectacular feat by one man to turn this island into the wondrous eco-friendly piece of naturalness that it is today. Visit our Turtle Island Fiji page for all the goodie greenness. 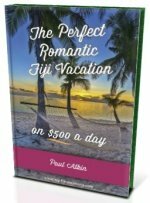 A special section and a must read is Eco-tourism on Turtle Island Fiji Islands. 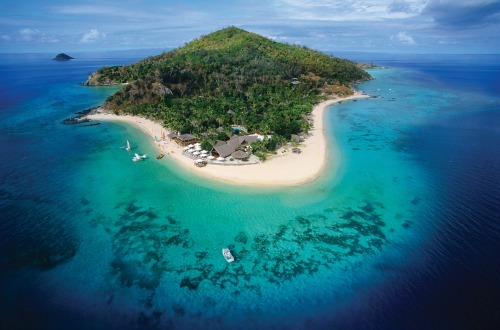 The second most popular island search is the naturally gorgeous Mana Island Fiji in the Mamanucas. Convenient, accessible and laid-back, a day trip is possible if not staying overnight. Why the asterisk? I might be getting picky here but it's connected to the mainland by a short bridge. Located just a short taxi ride from Nadi International Airport, Denarau Island has become very popular in recent times. The private upscale island is luxurious to the hilt with uber-convenience having Denarau Marina also there offering trips to the Yasawas and Mamanucas. Plantation Island Fiji is the most developed island in the Mamanucas. It's also known as Malolo lailai containing an airstrip, a marina, and a golf course. This tiny spec situated in the Mamanucas is circumnavigated by a gorgeous beach with palm trees. Renown as the party island, it's as pretty of an island as you are likely to see. Visit our Beachcomber Island Fiji section. Qalito, better known as Castaway Island, is a 70-hectare island in the Mamanucas. The inhabited island is renown for it's resort on the west side. Read up in our Castaway Island Fiji section. Similar to Beachcomber, it's a dot on most maps with equally gorgeous beaches. However, it takes a lot longer to walk around the whole island, say around 8 minutes... or 12 minutes Fiji time. Read up in our Fiji Treasure Island section. Yanuca is known for having one of the most popular resorts in Fiji, Shangri-La Resort & Spa. Like Denarau, it too is connected to the mainland via a causeway. Koro Island is located in the Lomaiviti Group and is the 6th largest island in Fiji. Freehold land is available and people enjoy an eco-friendly lifestyle on Koro. Laucala Island is a privately owned island now in the hands of the Red Bull billionaire Dietrich Mateschitz. He bought it off the late Malcolm Forbes in 2003, then preceded to build the most opulent resort in all Fiji. Other popular islands are Tokoriki Island, Matagi Island, and Yasawa Island not to be confused with the Yasawa group of islands.